Writing of Joseph Cornell, Jonas Mekas remarked that his films “deal with things very close to us, every day and everywhere. Small things, not the big things…His works have the quality—be they boxes, collages, or movies—of being located in some suspended area of time.” One finds a similar sensibility in the films of Brian Frye, particularly so in a cluster of 16mm works completed around the turn of the 21st century, just as the end of small-gauge cinema seemed all too immanent. 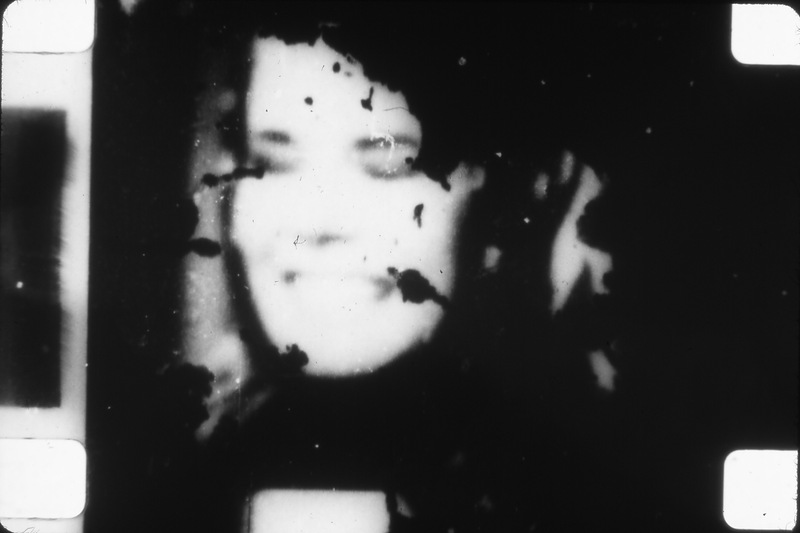 At once literal actualities and sphinx-like artifacts, Frye’s films might at first seem like outtakes from lost projects, or damaged archival isolates, bearing grainy images that beg for exegesis: Kennedy-era actors awkwardly intone lines from a portentous melodrama; a woman’s face flits in and out of legibility beneath a storm of visual debris; an old man points to a weathered gravesite, his lips mouthing silent words; Civil War soldiers maneuver at the edge of a forest. These moments play like misplaced bits of someone else’s memories, physical records of our world mysteriously unmoored from their origins. Followed by a conversation with Frye and Chrissie Iles. Brian L. Frye is an Assistant Professor of Law at the University of Kentucky College of Law, where he teaches class in copyright, intellectual property, nonprofit organizations, and civil procedure. Previously, he was a Visiting Assistant Professor of Law at Hofstra University School of Law. He was a litigation associate at Sullivan & Cromwell LLP. He clerked for Judge Andrew J. Kleinfeld of the United States Court of Appeals for the Ninth Circuit and Justice Richard B. Sanders of the Washington Supreme Court. He received a J.D. from the New York University School of Law in 2005, an M.F.A. from the San Francisco Art Institute in 1997, and a B.A. from the University of California at Berkeley in 1995. His research focuses on legal issues affecting artists and arts organizations. His critical writing on film and art has appeared in Film Comment, Incite!, and October, among other journals. Frye is also a filmmaker. Most recently, he produced the documentary film Our Nixon (2013), which was broadcast by CNN and opened theatrically nationwide. His other films have been shown in the Whitney Biennial 2002, the New York Film Festival, and the San Francisco International Film Festival, among other venues, and are in the permanent collection of the Whitney Museum of American Art. He is currently working on The Winds & the Waves, a documentary history of the media representation of the gay rights movement, and Andy & Julia, a narrative feature about a day in the life of Andy Warhol and his mother Julia Warhola. Chrissie Iles is the Anne and Joel Ehrenkranz curator at the Whitney Museum of American Art.